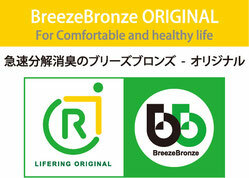 Choose from 3 varieties of BreezeBronze to match your needs. Created for and with the help of caregivers and their charges, it’s comfortable and supports you in building a healthy lifestyle by quickly breaking down and eliminating odors. With an original design from LifeRing, it’s a high quality product aimed at supporting a variety of consumers. Mainly targeted at department stores and home goods stores. B.B. Toughness is for those who make perspiration a daily part of their lives. It’s beloved by those who require a fast-acting odor break down and removal solution, including athletes, those working outdoors, and officials training under harsh conditions in the Maritime Self Defense Forces. B.B. Toughness quickly handles the odor caused by sweat dripping off the body to create a comfortable work environment. B.B. 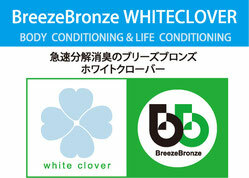 WhiteClover is designed to maintain the fast-acting odor breakdown and removal of BreezeBronze while meeting the various needs of our customers. 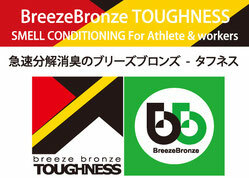 The concept is body conditioning and life conditioning. While considering a suitable design, size, color, texture, and use to match the bodies and lives of each and every customer, we developed a specialty product that creates a comfortable life. Mainly targeted at hospitals, nursing care facilities, and home nursing.